The plastic coated mesh is durable and blocks 70% of damaging UV rays. They are a stiff but flexible material that protrudes clear of the eyes. 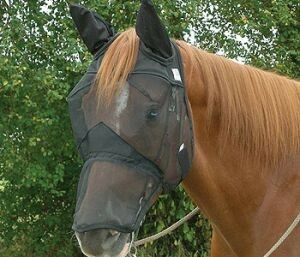 The edge of the fly mask is lined with a soft material, and the throat fastener is also soft and has a nice thick width. 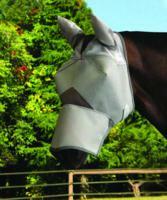 This avoids the hassle of breaking ties, and it is very comfortable for the horse. 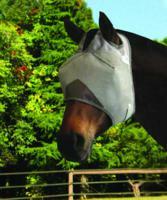 The long nose model is particularly useful for those of us who have horses with pink noses. 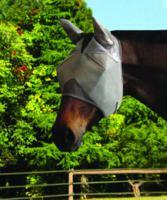 Sun block needs to be applied every few hours; many horses end up with sore and scabby noses. 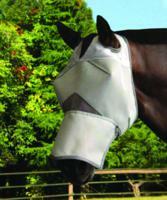 The long nose version of the Cashel Crusader fly mask assists in this problem.